My name is Sensei Helena Benge-Nilsdotter and I am the senior coach for the Rising Stars, along with a team of qualified instructors and assistants we teach around 90 children, 4 -12 years of age, Aikido on a Saturday morning. This consists of two sessions 9.30-10.30 & 10.30-11.30 and each group is split into three sections depending upon age and experience. Rising Stars Aikido began in January 2006 as many of the adult students wanted their children to learn Aikido and the values surrounding Aikido. We teach our students in a positive way, always reflecting on what they did well rather that telling them what they did wrong. This ‘praise’ way of teaching begins to enforce a more positive ‘self belief’ within the student instead of focusing upon the negatives. This makes for a more positive confident student as well as fun training. Aikido has strong values attached to its philosophy of non-aggression and these are reflected within our ‘Star Characters’, check out their page to learn more. The Rising Stars Aikido is a member of the United Traditional Aikido Association which is a full member of the British Aikido Board, the governing body for Aikido throughout Great Britain. All instructors are fully trained and the Rising Stars has been given ‘Clubmark’ recognition. REMEMBER. Never use Aikido in school or to show off to your friends. Aikido is for self-defence and when we train it is to better ourselves and not to harm others. Aikido is all about having fun. 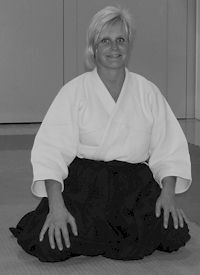 Sensei Helena ‘H’ Benge-Nilsdotter, 2nd Dan.